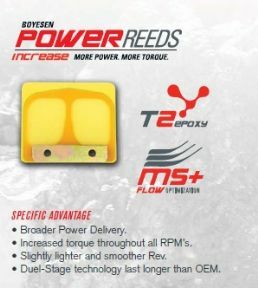 Secondary Reed (Top Reed) The top reed is specially shaped, lightweight and resilient for crisp throttle response at partial throttle or low RPMs. Primary Reed (Bottom Reed) The bottom reed is thicker, stiffer and ported to provide stability, maximum flow and horsepower at high RPMs. Rev-Plate - Allows the reed to open unimpeded and function more efficiently at higher RPMs.